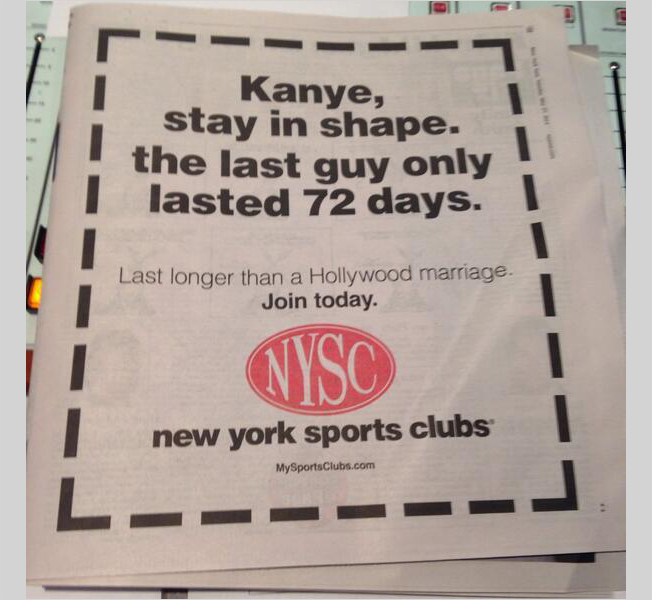 An easy target, to be sure, but here's a clever bit of celebrity newsjacking from a New York chain of gyms. New York Sports Clubs ran the ad above in today's New York Post, just a few days after the tabloid wedding of the year between Kim Kardashian and Kanye West. In case you haven't adequately been keeping up with the Kardashians, the ad references Kim's brief but zealously overhyped 2011 marriage to NBA player Kris Humphries. Of course, the message is a bit confusing, since it's unlikely that Humprhies suffered some sort of failed physique during his brief few months as a married man. Via the New York Post's Joel Pavelski.